I have been posting capsicum recipes for the past three days. My daughter was so upset that I have been making capsicum everyday at home and to cheer her up I baked Strawberry muffins for breakfast yesterday. 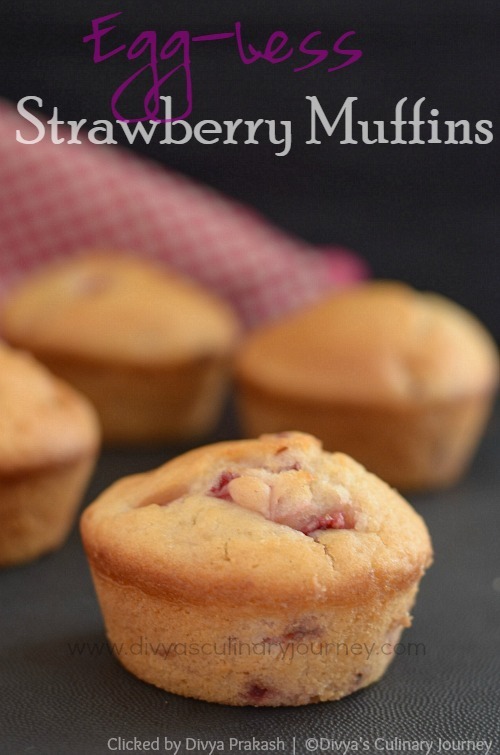 I have already posted strawberry muffin recipe with egg and also Strawberry banana muffins made in whole wheat flour. I usually follow either of the 2 recipes for baking strawberry muffins. 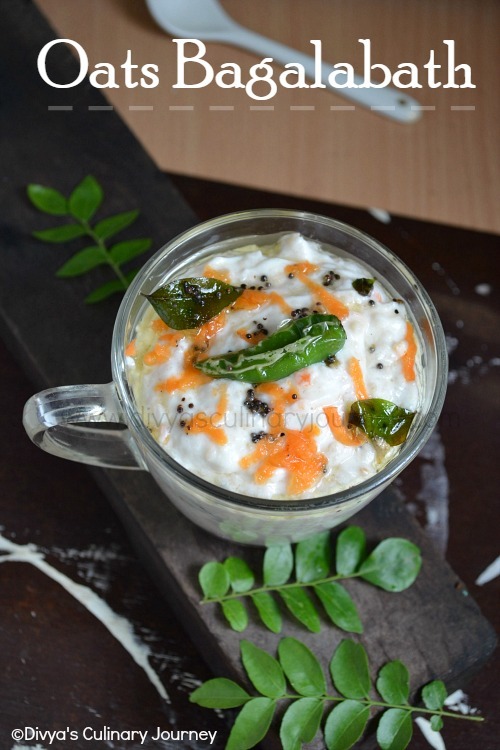 But this time I wanted to bake without egg and tried this recipe. It came out so soft and spongy. Kids loved it. 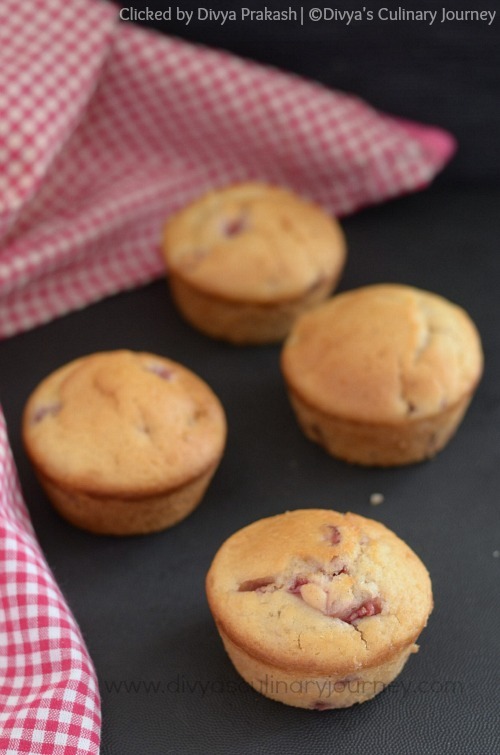 It is definitely a fool proof recipe for the perfect egg less strawberry muffin. 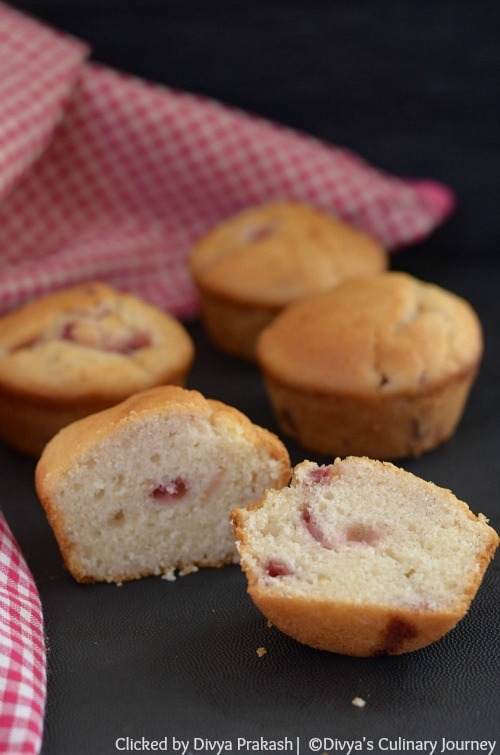 How to make Egg less Strawberry muffins? Pre heat the oven to 350 F. Prepare the muffin pans by greasing and flouring it or lining it with liners and keep it ready. In a bowl sift together all purpose flour, corn flour, salt, baking powder and baking soda so that it is well combined. In another bowl, mix yogurt and sugar well, then to this add milk, oil and vanilla extract and mix well. To this mixture add the flour mixture little by little and keep mixing till all the flour is added and a homogeneous mixture is formed. Hull the strawberries and chop them. Then coat them with a tablespoon of flour and add them to the batter and mix well. Pour this batter into the prepared muffin tins such that it is about 3/4th full. Bake them for about 15-20 minutes till the tooth pick inserted comes out clean. Let them cool before removing from the baking pan and then serve. It yields about 12 muffins. Baking time varies with oven check accordingly. Please make sure all the ingredients are in room temperature. Strawberry muffins looks so good. Delicious and healthy too..